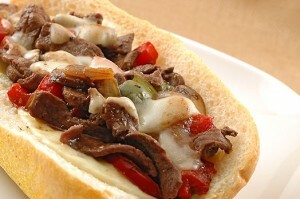 Italian Beef & Provolone . . . . . . . .
Italian Sausage . . . . . . . . . . . . . . .
Combo Beef N’ Sausage. . . . . . . .
Italians first began coming to Chicago in the 1850’s. By the end of the 19th century, they were immigrating to Chicago from Italy in rapidly increasing numbers. In 1900, there were 16,008 Italians in the city. By 1930 that number had multiplied by almost five. Most of these immigrants held labor-intensive jobs; they worked for the railroad, for factories and at construction sites. While Italian immigrants settled all over the city, the area now known as Little Italy Chicago saw the greatest concentration. Chicago’s Little Italy is bordered on the North by the Eisenhower Expressway, on the East by the Kennedy Expressway, on the South by Roosevelt Road and on the West by Polk Street.